What are we, if not an accumulation of our memories? Memories are a bit of a problem for the protagonist of SJ Watson’s debut novel Before I Go To Sleep. Twenty years ago, Christine was in a serious accident that left her without the ability to retain memories. That means every morning she wakes up in a room she doesn’t recognize, with a husband she doesn’t remember and in a body she’s troubled to discover is twenty years older than it should be. She muddles through the day, trying to piece her fractured life back together – with the knowledge that she’s going to have to do it all over again the next day. That’s right: she goes to sleep and her brain erases all the memories of the day. 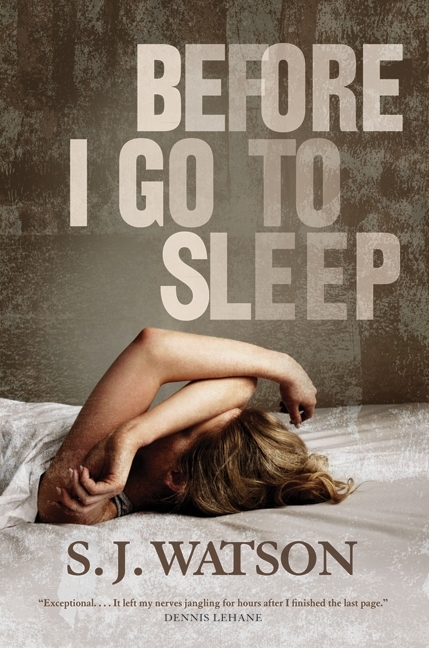 Before I Go To Sleep was my book club’s first read for 2012 and was also my pick. We had a lively discussion about the book’s merits and I am happy to say that with a few minor caveats, the women in my group (except for one) generally enjoyed the book. I alo think Watson was striving to write something more than just a thriller – although he did that quite handily. I think he was trying to say something about memory and how our memories shape us. It’s a fear of mine, really, to be old and not know my children or the other people who have been important to me. Christine’s situation means that she is forced to learn painful information over and over again – and it’s heartbreaking. The book had me in its iron grip until the last 50 or so pages- when I have to say that it fell apart for me. It wasn’t that I didn’t buy a certain part of it (and, really, it’s almost impossible to talk about without giving anything away), let me just say this: too much convenient exposition. Too neat. That said, Before I Go To Sleep was a great way to kick off our 12th reading year. SJ Watson talks about the book and his writing here. This entry was posted in 365 Days 2012, Book Chat and tagged 2012, book club pick, Book Review, thriller by Christie. Bookmark the permalink.